An interior design firm that makes your home feel beautiful and functional? Yes please. An interior design firm that improves the energy of your home that makes it a happier place to live? Absolutely! Such is the premise behind The Cristalline, the firm founded in 2015 by Rashia Bell, a crystal healer and designer and Elizabeth Kohn, who’s also a designer. The pair most famously for placed crystals throughout the new studio of The Class by Taryn Toomey, including under its floorboards to keep in love, protection and healing while pushing negative energy out. They do the same for homes, inputting their design expertise while also determining the best place for say, a Rose Quartz to let love in or a Black Tourmaline to keep out electric currents. We were so inspired by The Cristalline’s work that we followed them into their client’s space to experience firsthand how it all comes together in the home. Now more than ever, balancing our energy in our physical space seems so needed. What was your trigger moment in deciding it would be your life's work? It came out of a process of trying to balance my own energy, living in New York for so many years and constantly going. I was drawn to stones as a child and had worked in jewelry, so I loved being around stones. Years later I started to meditate but was continually defeated by my inability to focus. I had started collecting crystals and one day I decided to just take one and hold it in my hand. I felt the stone’s energy and the sensation racing up my arm. From there I went on to testing out different stones and seeing how different the energetic response was. As my knowledge with crystals increased, I realized that the cumulation of all of the different career paths was to merge crystals and interior design in an effort to both balance one’s energy and the spaces they inhabit. Such a wonderful idea. Can you tell us about the services The Cristalline offers? We aim to have The Cristalline be a full-service lifestyle company that helps you create balanced energy within all areas of your life. We believe that your home is the foundation for having a “well life.” Our specialized offerings include our Energetic Interior Design Services. These start with an assessment of the current state of your space both energetically and aesthetically, identifying imbalances and space challenges. We then offer recommendations to help create a space that is balanced in function, design and energetic perspective, incorporating crystals. From there we then delve further into the more traditional side of interior design in sourcing home furnishings, materials and space planning, but the unique aspect is really the merging of all of these components and how these changes can largely support your harmony and wellbeing. The most full-service layer of our work provides larger scale design services for the construction, project management and furnishings required for full space renovations. We also offer one-on-one private crystal healing experiences and workshops to introduce people to crystals. We do private crystal events and host wellness experiences, such as the Wellness Escape that took place in May in Colombia. That sounds amazing. We can’t wait to have you over! So if someone wanted to explore crystals on their own, how would they best go about it? The best way to explore crystals is to experience them. Go to a shop, touch and feel them, note the textures, shapes and sizes, then ask questions about them. I believe those interactions are a great introduction to crystals and once your interest is piqued, you learn about them in other ways. Our Crystal Healing workshops are often the first place that people come when wanting to learn more about crystals. It's a joy to be able to provide a vehicle for them to be able to experience the stones firsthand in a relaxing environment. It changes by the day and depends on my mood, energy level and what I am trying to work on. The crystals that definitely blew me away at first were stones such as Black Tourmaline, Hematite and Pyrite that block the Electromagnetic Frequencies that radiate off of our technology and all of our devices. I put them everywhere, on my cable box/wifi modem and on my cell phone at night. You cannot have enough of these stones especially living in NYC apartment buildings where we not only have to worry about our own devices but all of the other ones in the apartments around us. What is the difference between your work with crystals and Feng Shui? We are interior designers, and we are always looking at spaces with our aesthetic knowledge, our honed taste, and a trained eye. These tools give us the ability to grasp within a room the emotions and feelings that they evoke that are the result of beauty, proportion, fluidity, functionality. We instinctively know when a space does or doesn’t feel right and can immediately identify if it is the result of design, function, poor space planning or energetic factors. We help people attain the best flow and alignment between all of these elements. We're sure there are some exciting projects and future plans for The Cristalline. Can you share some? We did a collaboration with Onda, the natural beauty online destination. It is a Self-Care set of rough crystals coupled with our Himalayan salt bar. I spent five years as a cosmetics buyer, so it is fun when past and present lives collide. We are launching e-commerce, which will offer our personally selected crystals and exclusive designs for the home. We’re planning a soft launch this summer with a revamped website and full rollout in the fall. Additionally I am taking The Cristalline on the road within the US and South America to offer our services and events to those outside of New York. I love spreading the crystal love all around the word! We can’t wait to check it all out! Lastly, what makes you fly? As a designer the ability to travel is my oxygen. Discovering a new place, an unfamiliar culture, artisans and their crafts that is what inspires me most. I relish seeing crystals from where they grew from the earth. The history, the rawness, the ability to resonate with the fruits of the earth is a truly moving experience that never ceases to ignite my passion. 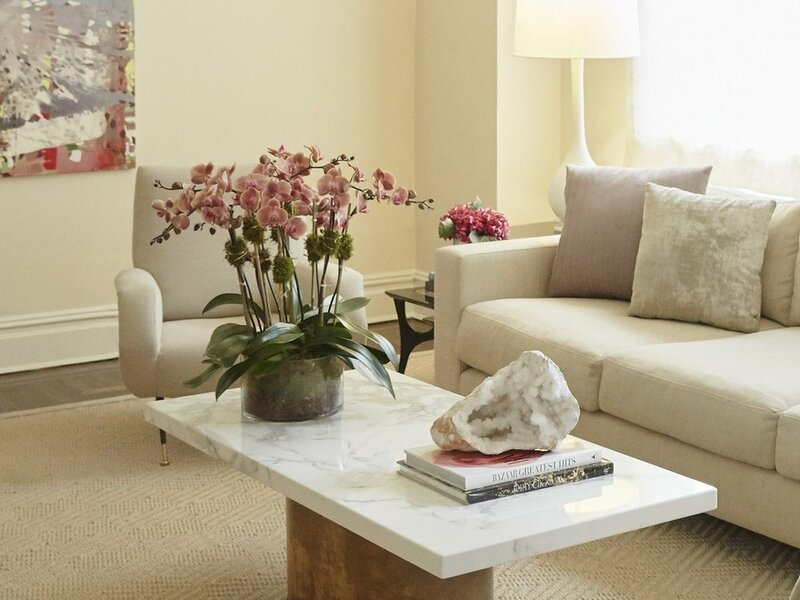 The Cristalline’s Rashia Bell and Elizabeth Kohn take us through crystals and the how, which and where to incorporate them into your living space. Check out this easy guide below to bring some positive energy into your home. The Septer refers to the structure of this special type of Amethyst. Their pointed structure 'points' us in the direction of things we do not have, yet desire, and show us the path to how we can grow. I like Amethyst in the bedroom. It's a stone of protection so it creates a safe space for a restful sleep. 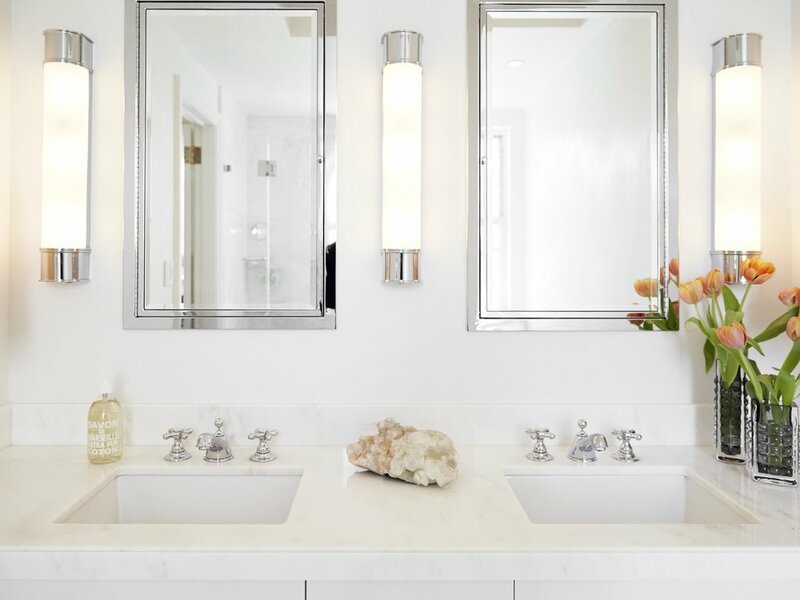 We like to use large geodes in the home because they help maintain clear energy flow within spaces. Barite (top left) - helps to uncover dreams and access the spiritual world. 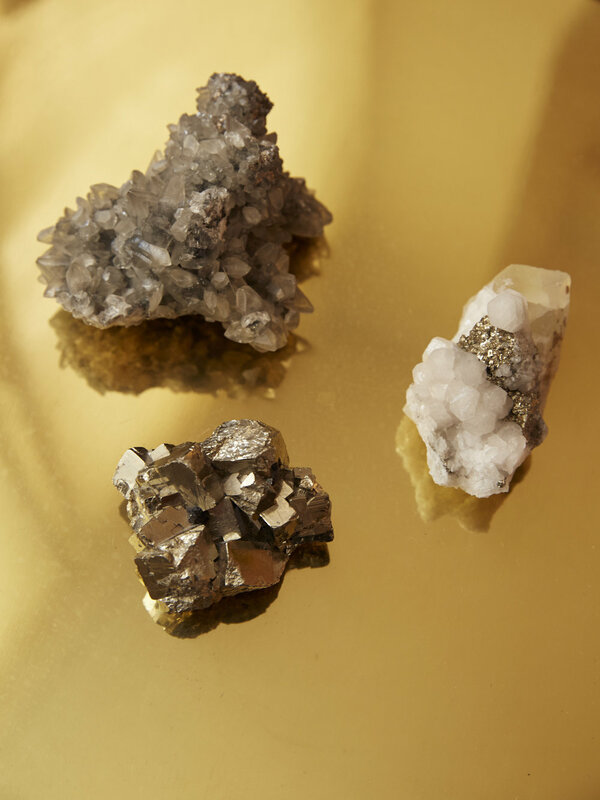 White Calcite with Pyrite (middle right) - Both of these are viewed as protection stones. White Calcite is a very grounding and calming stone, and pyrite helps to block negative energy. Pyrite (bottom left) - Pyrite also helps to block the EMF frequencies from technology. Apophyllite is a gentle, beautiful stone that helps one to forge a spiritual connection. Stilbite clears the energy of the mind so that one can find inner peace and take charge in discovering dreams and desires. We like to use this stone in bedrooms and bathrooms because it helps create very serene energy in it's surroundings. This is a calming and uplifting stone that helps to create universal energy. In the entry of the home, it helps to maintain stable energy levels by blocking outside noise and distractions. We chose this blue kyanite for a young child’s room because it is a very nurturing stone that enhances communication and expression to support development and learning. It is a great stone for children as they learn to read and articulate themselves.